This is “The Pacific and Antarctica”, chapter 13 from the book Regional Geography of the World: Globalization, People, and Places (v. 1.0). For details on it (including licensing), click here. The immense tropical Pacific realm and the ice-covered continent of Antarctica have almost opposing physical characteristics, but they are similar in that they are remote and isolated from the rest of the world. Understanding the geographic qualities of these two realms will help in comprehending the unique traits that humans have developed to survive in diverse environments. Both places include large physical areas with vast open spaces between human settlements. In the Pacific, human settlements are on islands. The only human settlements in Antarctica are isolated research stations. Historically, the South Pacific required a water-based transportation network, and in Antarctica, humans traveled across the snow and ice exploring the earth’s southern extremes. Air travel is now available to connect both places with the rest of the world. Almost all of Antarctica rests south of the Antarctic Circle. Antarctica is a continent surrounded by the Southern Ocean. The next nearest continent is South America. Many countries have laid claim to sections of Antarctica, but the continent remains off limits to industrial development and many other activities. The hundreds of islands of the South Pacific are surrounded by the Pacific Ocean and make up the largest geographic area in the world. The primary realm includes the island groups in the tropics between the Tropic of Cancer and the Tropic of Capricorn. 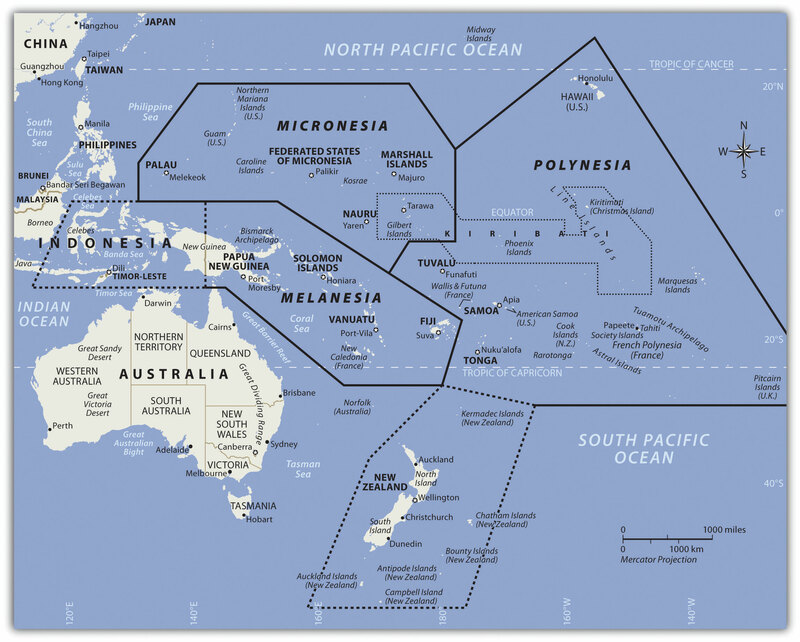 There has been little industrial development in the South Pacific. Just as Antarctica has been divided up and claimed by other countries, though it was not colonized by them, most of the islands in the South Pacific were claimed or colonized by the imperial powers of Europe, Japan, or the United States. Both areas are considered to be peripheral realms in the overall scheme of the global economy. Tourism is the major activity in the South Pacific, and research and tourism are the major activities in Antarctica. Both areas have opportunities for greater economic development in the future. However, the difference is that Antarctica is not a country, and any benefit will go to the countries with claims on the continent or to the businesses taking tourists there. Both the Pacific realm and Antarctica would be heavily impacted by increased climate change. Rising temperatures would continue to melt the ice in the polar caps, which in turn could raise sea levels. Changes in precipitation patterns could seriously alter the biodiversity of tropical islands in the Pacific, and changes in temperatures or precipitation could affect agricultural activity and tourism on many islands. Climate change in Antarctica could cause a further decline in the populations of penguins or other organisms.